The 231 hectare Okia Reserve on Otago Peninsula is the largest managed by the Yellow-eyed Penguin Trust. It was jointly purchased with the Dunedin City Council in 1991. It is bounded by the 3.5 km long arc of Victory Beach on one side, and on the other by the Pyramids, Taiaroa Hill and the sandy Okia Flats with their relict dune fields. Several firebreaks crossing the reserve are designed to stop the spread of fire, one of its major threats. Hundreds of trees and shrubs have been planted each year to enhance hoiho nesting habitat and other areas of biodiversity value. Farmed for more than 100 years, the face of the Okia Flats is changing, with revegetation and natural regeneration combining to offer new opportunities for native species. 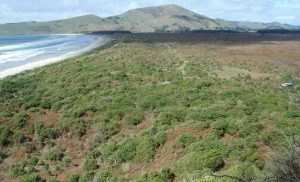 Revegetation has been carried out at the northern end of Victory Beach, and on the Margaret Hazel and Mainland slopes adjacent to Taiaroa Bush. Pikao planting with associated coastal species was carried out mid-beach as part of the Dunedin City Council Dune Conservation programme. Penguin monitoring is carried out over the breeding season, with a nest search in October, and monthly monitoring through until the chicks fledge in early February. Other species found in the reserve include the New Zealand sea lion and New Zealand fur seal. In 2003/04, a southern elephant seal gave birth to a pup on Victory Beach. After an absence of decades, the New Zealand fern bird has made a return. This reserve is open to the public with a loop track of the northern area. Download the walk information which explains the highlights of this reserve.